Excuse Me, Sir. May I Interest You In Things You Don't Need? In a few days I’ll arrive at ILTA 2009, the most value-driven conference in Legal IT, or so says the advertising. I’m a sporadic attendee to ILTA, having been in and out of the legal technology space for the better part of 20 years. I have fond memories of dashing from booth to booth at LawNet (ILTA before its re-branding) in the mid-’90s, or furiously driving around searching for a Radio Shack in Scottsdale, seeking various spare cables and parts as we struggled to configure our ISDN lines to showcase our website, which was quite a novelty then. We also showcased our CD-ROM offerings on a three-workstation Windows NT network which I was required to configure, but my experience and that of everyone nearby seemed to be limited to Novell, the dominant network player then. Remember those days? It was a memorable feeling of elation when we were finally able to bring up our Internet connection or networked CD-ROMs moments before the exhibit hall opened and hundreds of professional technologists swarmed the floor to play “Stump the Vendor.” As memorable is the feeling that much of the drama was self-induced and preventable. I mean no disrespect when I suggest that my colleagues in our IS/IT department could have put a bit more time into planning before sending an executive into the field with minimal formal technical training and with new and untested equipment and configurations. And so I’ll feel compassion when I walk through the ILTA exhibit hall and observe the confounding technical issues that are the hallmark of any salesperson’s product demonstration! I’ll be less compassionate when I observe poor salesmanship. There’s no excuse for being ill-prepared for spending five days surrounded by customers. In an earlier life in the publishing field, I regularly attended MacWorld and Seybold conferences as a vendor representative for a software firm. We spent the day before each conference learning a new script which had been carefully designed to highlight features and functions of whatever software release took place in conjunction with the conference, and we were tested and re-tested until we mastered the details. However, when I walk the exhibit hall at many legal technology conferences I get the distinct feeling that little preparation has taken place. For my legal vendor readers, here are several suggestions for improving your performance at trade shows and conferences. Don't limit your role to the exhibit hall. As I’ve written previously, there is a large divide between the vendors to the community and members of the community. There’s no earthly reason why a vendor can’t become part of the community to which she sells, but it involves sticking around after hours, getting to know your clients and potential clients as people with complicated lives and challenges and not just as “prospects.” You have to really enjoy your market and the people in it to make this work, it can’t be forced. If one of your colleagues suggests a team dinner offsite once the exhibit hall closes for the day, politely decline and find a conference-related event to attend, or beg another vendor for an invite to their event. Save the team dinner for the last night when the clients have gone home. Embrace the conference as a learning opportunity. There is nothing more powerful than having the ability to speak intelligently to a prospective client about their workday, knowing the challenges they face, the tools they use, the politics they endure. 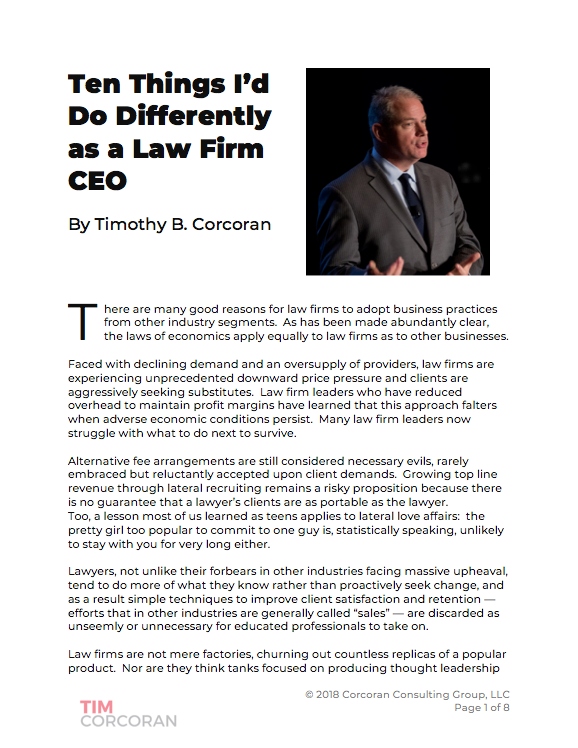 I often counsel lawyers and law firm executives to soak up knowledge from the vendors, because the vendors have insight into hundreds of firms and within the bounds of good taste and confidentiality they can share what works and what doesn’t. Similarly, spend time walking the exhibit hall, meet other vendors, ask what they do, learn what objections they face, understand what tools and applications they interact with, or should interact with. In some cases the knowledge of upstream and downstream apps will be helpful in your role; in other cases, merely being knowledgeable about the other vendors your clients rely on gives the clients more reason to trust in you. When possible, attend the workshops and speeches, regardless of the content. You may learn something valuable, or you may meet someone valuable. Know your value proposition. Some organizations develop a simple elevator script, which the salespeople promptly forget. Others devise more lofty mission and vision statements. Whatever you call it, it’s critical to know what you offer, what problem(s) you solve, and for whom. It’s startling to walk into a vendor booth and ask a simple question, “What do you do?” and receive a blank stare or some fumbling buzzwords in response. You may be the biggest dog on your block, but maybe I've never heard of you. In fact, maybe I have heard of you and have even done business with you in the past, but pretend for a moment that I know nothing about you or your offering. Help me understand why what you offer will help me. I’m a proponent of the consultative school of selling, which is as far as one can get from blindly selling features and functions on a trade show floor. That said, there are going to be some commonalities among the visitors to your booth, so know them in advance and prepare to address them right away. Respect the competition, but don’t let the competition define your offering. A vendor executive, in response to my “What do you do?” query, once responded, “You know MegaVendor Inc., right? Well, we’re like them but smaller and more nimble and we don’t cost as much.” If you think that’s outrageous, at the same conference another vendor rep replied, “We’re like MegaVendor, Inc., except we’re better because we offer more robust functionality and we have a true web interface.” In both cases, the top two competitors could only define their value proposition by how they compared to the leading supplier. The leading supplier, by the way, does a terrible job selling its product, yet it remains the dominant installed base because, at least in part, the competition helpfully defines them to clients as the standard! Remember that I buy because of the benefits I derive, not the features you sell. The greatest failing of most salespeople is to focus on features rather than benefits. Understanding the difference is a fundamental component of every sales training program I've ever given or attended. Yet we still make the same mistakes over and over again. Conferences and trade shows reinforce this bad behavior because, in part, you can't conduct an in-depth needs analysis when the prospect stops by the booth to see a quick product demo and enter the drawing for free swag. Also, many conference attendees have a similar profile which makes it easy to take shortcuts: "From your badge, I see you're an IT Director with a mid-size law firm on the East Coast," the salesperson says, but his internal dialog adds "... which means you have a declining budget in this tough economy, you spend all day reacting to one-off lawyer requests rather than executing a well-designed strategic technology plan, your greatest challenge is that you're measured by the responsiveness of the HelpDesk rather than how well-integrated your systems are, you know all about CRM and ERM and KM but you may not know about our latest release." Confident that he "knows" your needs, he then launches into a demonstration of the latest release's new bells and whistles. Sometimes the demo sparks interest in the prospect, sometimes it's wildly off the mark. The demo concludes, the business card is dropped in the fish bowl. Rinse and repeat. There's nothing wrong with asking a few qualifying questions to help you customize the demo. Savvy sales managers know that the reason we memorize demo scripts isn't so we can recite it verbatim; we memorize it so we can easily hop around the product showcasing the features that best apply to the prospective client's needs. A feature that fills a need is a benefit. A feature that I don't need is a waste of my time. If you don't know the difference between a feature and a benefit, remember that a benefit answers the question, "So what?" If I live in rural Alaska with few paved roads and to get anywhere I have to drive over rugged terrain, then my vehicle's four-wheel drive capability is a benefit. If I'm a retired senior citizen living in the sun belt and my primary transportation is a golf cart, the expensive four-wheel drive option on the vehicle I drive to the store twice a week is an expensive and needless feature. It's important to know not just the features of your product, but why having this capability might matter to the buyer. Think in terms of total cost of ownership rather than merely price. This concept is elusive despite its simplicity, and both vendors and buyers do it poorly. At its core, understanding the total cost of ownership means factoring in more than the sticker price of a product; it also requires factoring in a time horizon and all adjacent activity needed to implement the product. I’ll elaborate elsewhere on the financials underlying this concept, but for our purposes today suffice it to say that the buyer doesn’t simply purchase your product and call it a day. There are internal costs of sunsetting whatever is in place today, retraining, connecting to other systems, and so on. Similarly, there are presumably cost savings accompanying your product, such as lower maintenance, less downtime, improved functionality that eliminates the need for 3rd party apps, etc. It’s critical to understand the wider context of the purchase to truly understand the total cost of ownership. Too often vendors focus on rate card price and how this compares to the competition. Buyers, by contrast, too often focus on the vendor’s rate card price and how this compares to the competition. Forgive the amusing wordplay, but the inherent takeaway is that vendors focusing on total cost of ownership may need to help educate the buyers to make an informed decision. This, in a nutshell, is consultative selling. These ideas are just a starting point to improve your selling game. Product knowledge and memorization of objection handlers simply isn’t enough. Market knowledge, client environment knowledge, empathy and a bit of finance are more critical than ever in today’s tough economy. If you’re not spending time embracing these concepts, I can assure you, some of your competitors are. It’s one thing to lose a sale to a better product. But there’s no excuse for losing a sale because the competitor’s salespeople better understood and addressed the client’s needs. I’ll be walking the exhibit hall at ILTA and taking notes. In some cases I may be there at the request of a vendor’s CEO to conduct a “secret shopper” audit of an organization’s sales efforts. But I’ll also be looking for successes stories I can highlight in this space. Happy selling. See you at ILTA!